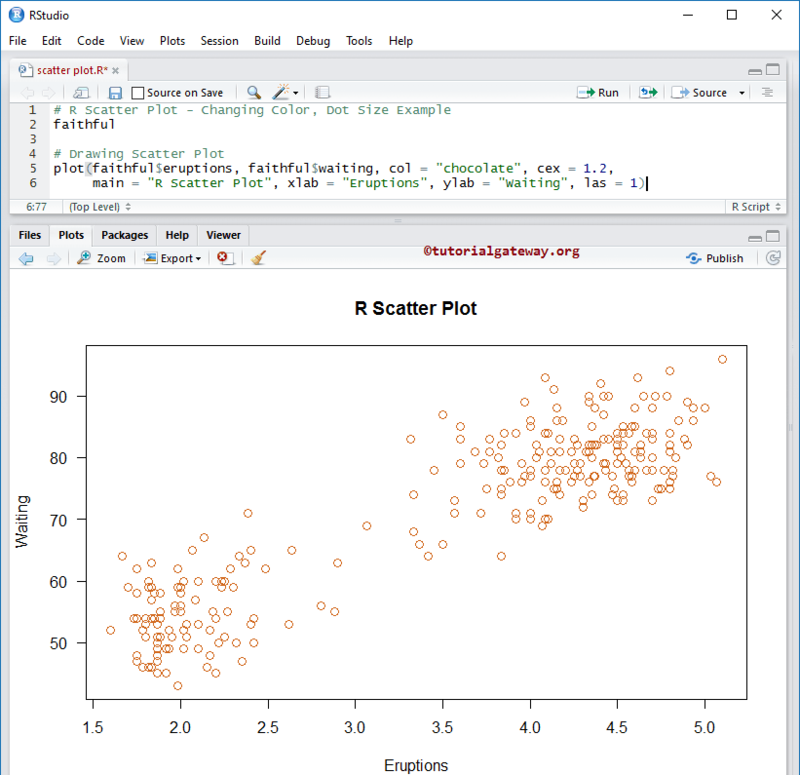 The Scatter Plot in R Programming is very useful to visualize the relationship between two sets of data. The data is displayed as collection of points that shows the linear relation between those two data sets. 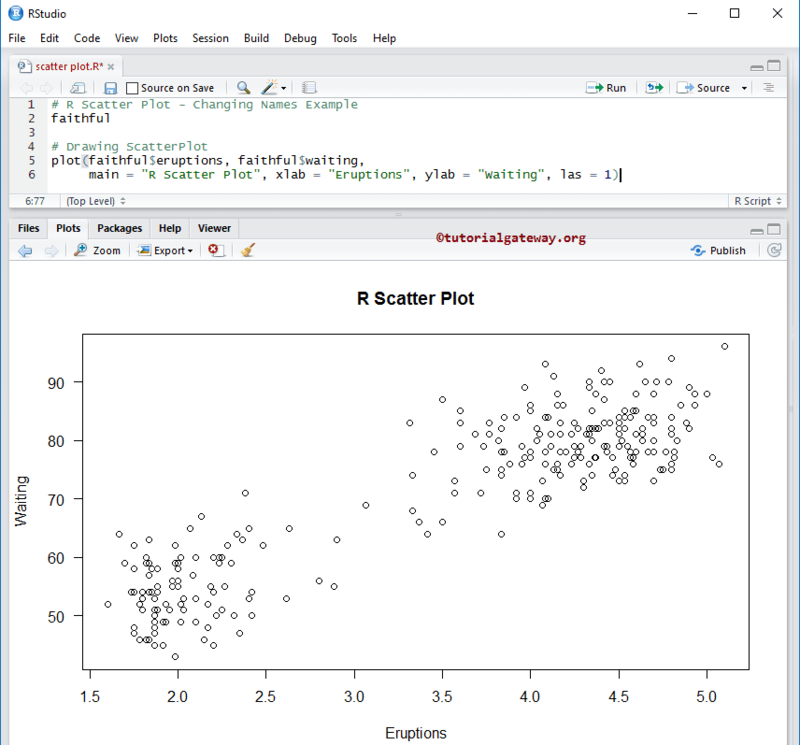 A Scatter Plot is also called as scatter chart, scatter graph, scatter diagram, or scatter gram. For example, If we want to visualize the Age against Weight then we can use this Scatter Plot. 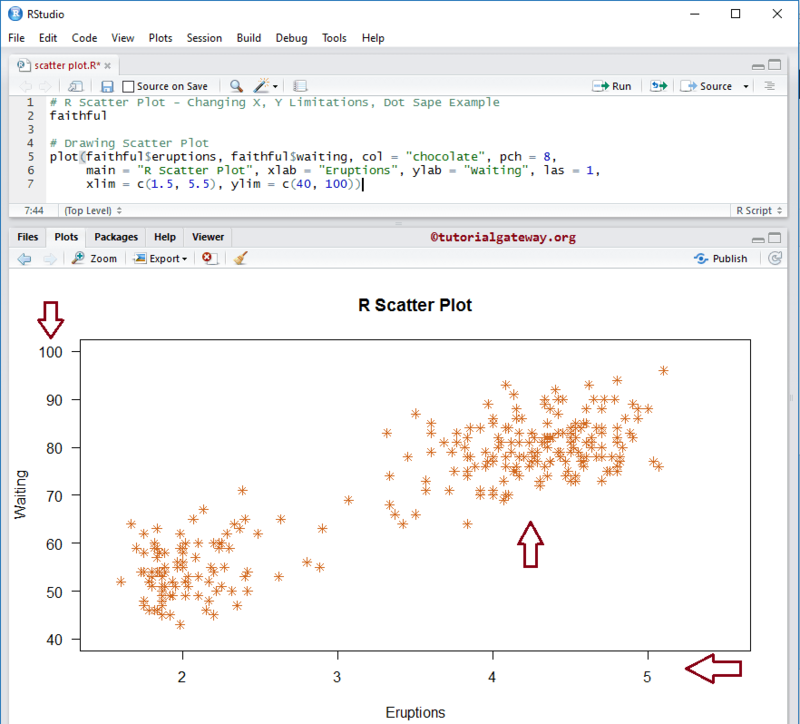 In this article we will show you, How to Create a Scatter Plot in R, Format its color, shape, and adding the linear progression of Scatter Plot in R Programming language with example. x, y: Please specify the data sets you want to compare. Here, you can use two seperate vectors, or Matrix with columns, or lists. type: Please specify, what type of plot you want to draw. 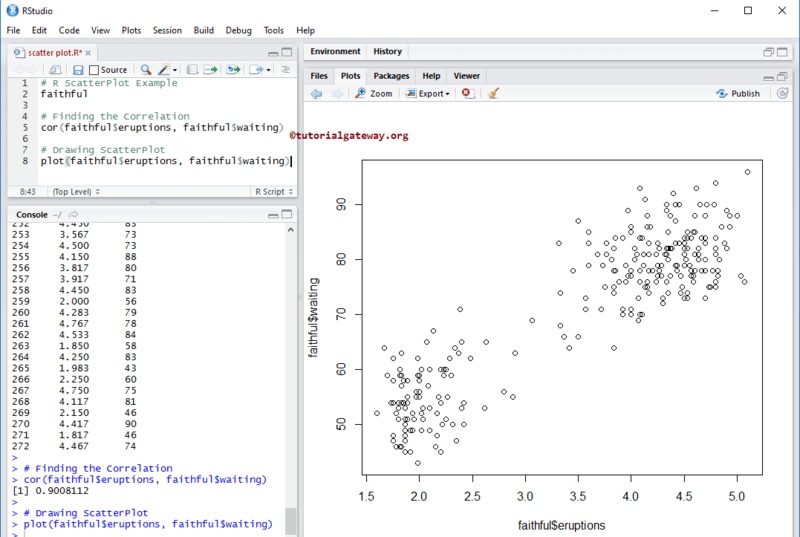 sub: You can provide the subtitle (if any) for your scatter plot. frame.plot: It is a Boolean argument that specifies, whether a box should be drawn around the plot or not. panel.first: Please specify an expression that is evaluated after the axes is drawn but before the points are plotted. panel.last: Please specify an expression that is evaluated after the points are plotted. asp: Please specify the aspect ratio of the plot (as y/x). faithful data set will return the output as a List. So, we are using the $ to extract the data from List. main: You can provide the Title for your scatter plot. 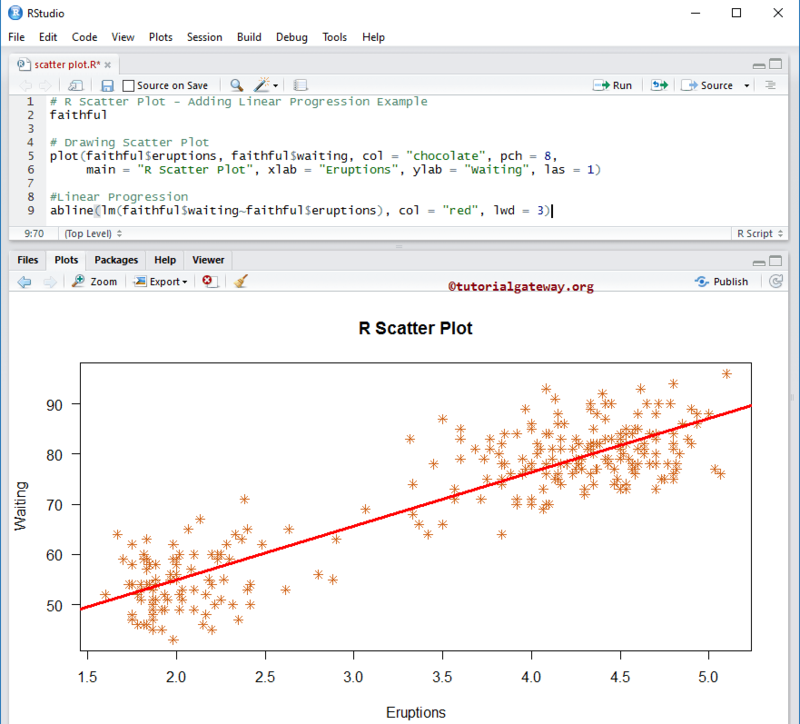 In this example we will show you, How to change the scatter plot color using col argument, and size of the character that represents the point using cex argument. col: Please specify the color you want to use for your Scatter plot. In this example we will show you, How to change the shape using pch argument. In this example we will show you, How to find the linear progression of two data sets and add it to scatter plot using abline function. Next, we are adding a line, and the line represents the linear progression.